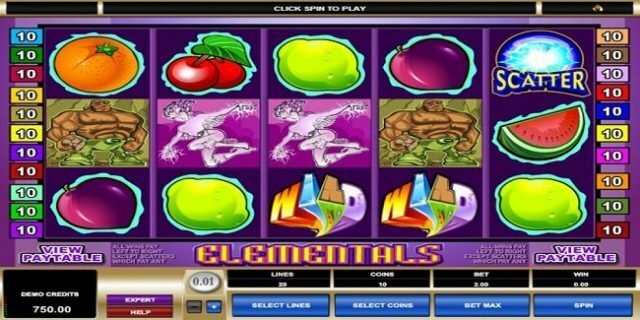 Elementals Slot is a Microgaming based online video slot game of 5 reels and 20 paylines. The game is inspired by 4 elemental spirits: Gnome, Undine, Sylph and Slamander. The reels of the game are being set against the purple background and the basis of elementals. The slot game contains a bunch of fruits as symbols. 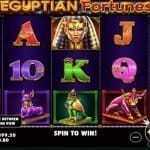 You can play Elementals Slot at any Microgaming online casino site. Minimum coins per line for the game is 1 and maximum coins per line is 10. 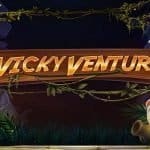 Players will have to select denomination ranges from 0.01 to 0.5. Basically there are eighth buttons/options available in this slot game and they are “+/-‘to Set the coins size. “Select Lines” option is used to Set the number of lines, ‘Select coins” is used to Set the number of coins per line, ‘Spin” is used to set the reels in motion. “Bet Max” can be used when a player wants to lat the game for a wager of 0.5, “Expert” option is used to turn the expert mode on and “Gamble’ option is used to start the gamble feature. The “Auto Play” option can be used to turn the reels without interruption for a chosen number of times. The word ‘wild’ is the wild symbols here which can be substitute for all other symbols except the scatter symbol and for trigger. All wins with wild will be doubled. Five wild symbols will award you 5000 credits. The game offers a jackpot of 300 times of your total bet. The Elementals slot contains the scatter symbol as well which is Crystal Ball. 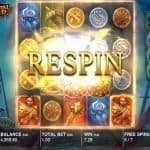 You can win 20 free spin, when the letter ‘E’ in the sun comes on the active reels.